Kazakhstan’s national carrier Air Astana will have its first re-engined Embraer E190-E2 regional jet delivered in November next year. The airline plans to operate the aircraft on its short-haul routes, Embraer’s Airline Operations Analyst Vadim Fokin told the ongoing Wings of the Future forum in Moscow. Air Astana has a total of five E-190E2s on order. The new aircraft will replace the airline’s existing E190s by the time the latter’s lease term expires in 2019. The carrier earlier reported that the fleet renewal effort would help it generate higher revenues on short routes. The Embraer E190-E2 modification commenced flight tests in May 2016. Fokin confirmed that Norway’s Wideroe will become the launch operator, as expected, receiving its first aircraft in the first half of 2018. 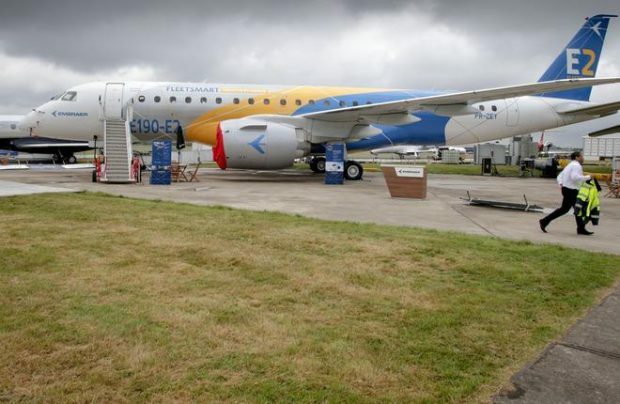 Embraer’s E-Jet E2 family backlog currently stands at 730 units, including 285 firm orders. Contracts have been signed with both airlines and lessors, including Aircastle and Aercap. In particular, Aercap will lease its aircraft to Air Astana. There is a growing interest in Embraers in Russia as well, Fokin noted. Komiaviatrans has contacted the manufacturer, but there is no firm order as yet. The carrier’s executive director, Vadim Smirnov, was quoted as saying that Е145s might be added next year. S7 Airlines, one of Russia’s largest carriers, has recently started expanding its regional fleet with Embraer E170s.